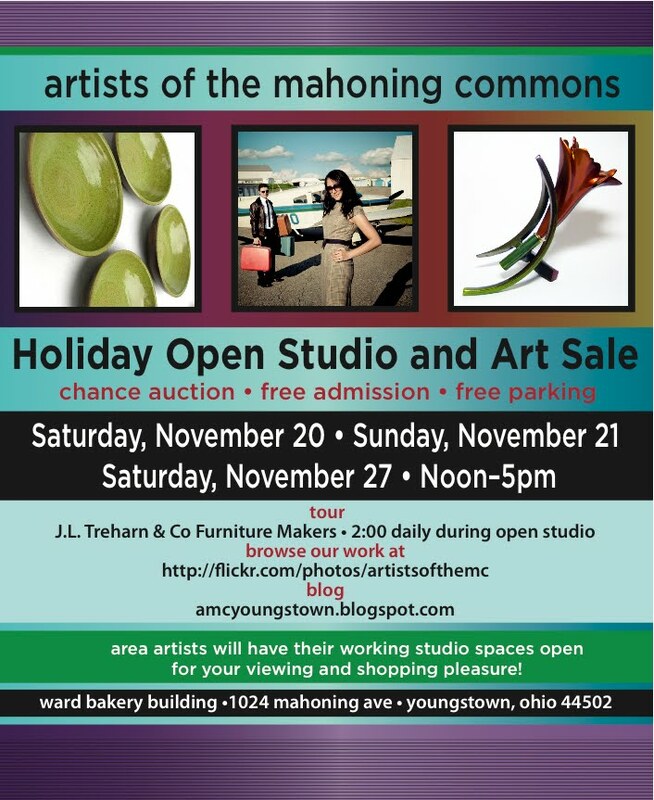 The Artists of the Mahoning Commons Open Studio Sale is upon us! You can be assured of seeing work by the finest artisans and crafts people the region has to offer as well as a cozy holiday atmosphere and a fantastic Silent Auction. Each year our show grows significantly. We are pleased to participate in the positive evolution of Youngstown and to provide support for the inner city and overall cultural community. This Holiday season the Ward Bakery boasts 4 floors hosting nearly 40 artists and artisans who produce astounding work. You will see Painting, Sculpture, Photography, Prints, Ceramics, Jewelry and a wide array of unique and rare items. 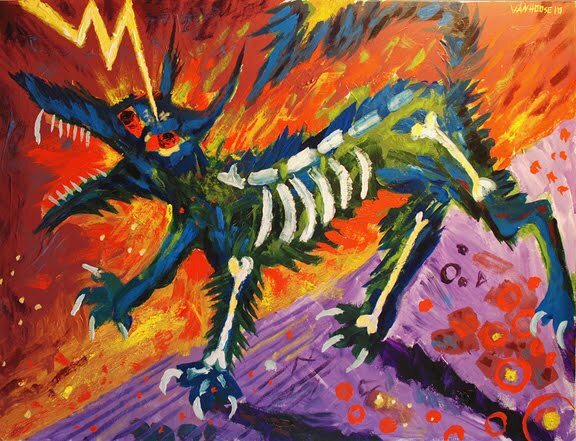 All artists are required to donate to the Silent Auction, and your chances are great for acquiring original art for the price of a one dollar ticket. Click on image for larger, clearer picture. Since the introduction of the Calvin Center Idea Incubator, the artists, actors, musicians and business owners have been working together to promote events of the Mahoning Commons. Saturday, November 27th, the entire street will celebrate the Mahoning Commons Holiday Fest. Most venues will be open from noon until 5 pm. However some will feature additional hours later or earlier.This season Jubilee Limousine will provide FREE shuttle service, featuring the refurbished WRTA Trolley, linking the various venues. Festive balloons and banners will mark the Trolley stops. -Fellows Riverside Gardens. The Garden Cafe will be open until 3pm and the Shop in the Gardens will be open until 5pm. 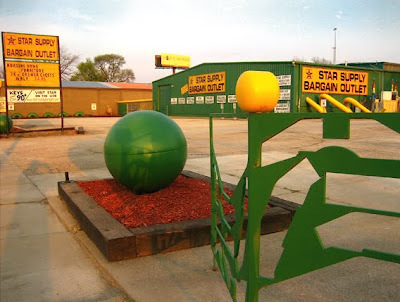 -Star Supply Bargain Outlet. In its 40th year, Star will be open until 5pm Saturday. This store has alot to see. It is possible to spend an entire afternoon here browsing the aisles. There is a wonderful collection of historical items and oddities on display , as well as an ever changing merchandise selection. Thanks Star Supply for supporting the cultural endeavors of this city! -Calvin Center Idea Incubator will be hosting Artists of the Rust Belt Fine Art and Craft Show on Saturday, November 27th from noon untill 5pm and will haveBands later in the evening. 18 years and older for the evening events. Beer and food will be available for purchase, and the Notorious Viking Jim will be the House DJ. -Lemon Grove. Youngstown's most popular downtown cultural venue features fine food, drinks, coffee, great art displays, live, local music and a painting demonstration. -B&O Train Station. This restored, classic piece of Youngstown's historical architecture is famous for their brewery where they make popular Rust Belt Brew. Enjoy their beer inside at the lovely bar or outside around the newly installed fire pit. -Youngstown Maennerchor. Originally founded in 1863 as a German Man's club, features traditional German food. Stop by for a taste of Youngstown's ethnic history! -Santisi Wholesale Foods. A specialty food store specializing in Italian staples and delicacies. Stop by and pick up a gift basket, holiday tray, or some gourmet cheeses from their wide selection. -Victorian Players. A Victorian Era church, circa 1890, houses this lovely theater. The Vic will be featuring tours and information on upcoming events. -Ward Bakery will feature the Artists of the Mahoning Commons Holiday Open Studio and Sale hosting 40 or more artists with Paintings, Sculpture, Photography, Jewelry, Ceramics and a wide variety of other craft items. Hours are noon until 5pm. 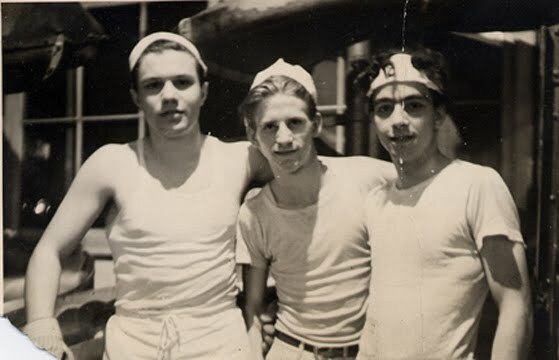 Since the early 1980's, the Ward Bakery has been and incubator for artists, musicians, actors, film makers and those involved in cultural pursuits. 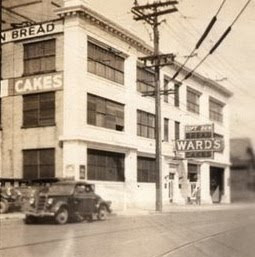 By the turn of the 21st century, the Ward Bakery had established itself as a grass-roots driving force behind Youngstown's cultural community. With the advent of the Artists of the Mahoning Commons and the seasonal Open Studio Sale in 2003, we became a significant part of the Youngstown Renaissance. Through the 1990's the area known as The Mahoning Commons was a difficult and dangerous place, but thanks to the efforts of the Mahoning Avenue businesses, the City, State and Federal governments, this area has become a gateway to the city. Derelict buildings have been torn down, streets have been paved, new bridges have been built, major improvements to Mill Creek Park have been made, and neighborhood watches(through the Ward Bakery Building) have been established. We are proud to say that that we have been instrumental in many of these changes and that Lower Mahoning has been truly transformed. It is true that much of our efforts have been geared toward reintroducing suburbia to our much maligned city. Youngstown's current, greatest contributions to the Valley (and which are sorely lacking in Suburbia) are cultural, and people from suburban areas have been eager to participate in these pursuits. For years we have been on the forefront on raising awareness outside of the city about our city's cultural resources. However, the Artists of the Mahoning Commons are engaged in other endeavors which often go unnoticed. I believe our greatest contributions are to the Inner City of Youngstown. For decades the people of the lower west side and upper southside have suffered severe economic difficulties, extreme crime and cultural debasement. We bring to these people a sense of hope, prosperity and enrichment through our yearly events. Anyone can walk through the doors and enjoy the art, music and food free of charge. The majority of bakery participants are college graduates, predominately from YSU, who are more than happy to engage the neighborhood people. They can see through example that Youngstown is not a hopeless place and that even a higher education is not out of reach for them. Many of the neighborhood children who attend our events rarely, if ever, have the opportunity to see artists at work, original art and the workings of art business. Our Open House provides them the opportunity to see that there are other choices available to them besides the negative pathways to be found within our sometimes troubled neighborhoods. 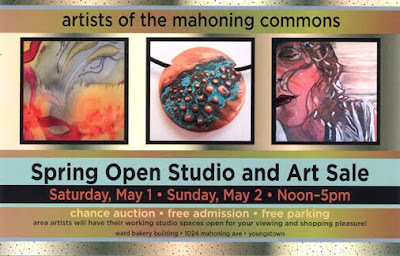 Many people believe that Artists of the Mahoning Commons Seasonal Open house Events were established solely for the purpose of making money. In fact, for many of us, these events are a break even propositions at best. There were several years that our budget was badly lacking, the economy was on the skids and our attendance was low. However, we persevered because we believe in this city. We know that our contributions are absolutely necessary to bring the city to standards enjoyed by similar cities in the region, and that the people of out city deserve options and enrichment that the Valley can't provide for them. It is our desire to demonstrate that Youngstown is truly a good place, inhabited by caring, aware, educated people with altruistic visions. After so many years of suffering that we all endured, we know that through grass roots efforts such as ours, Healing of the City is occurring and Prosperity is taking root. These are things that everyone in our valley can enjoy. It's Not Just the Ward Bakery Any More! The Mahoning Commons area is located on lower Mahoning Ave. Between the Mahoning Ave. Bridge and the Spring Street Bridge, Youngstown, OH. As I'm sure you've heard, Youngstown and the Mahoning Commons have a new Art Festival. 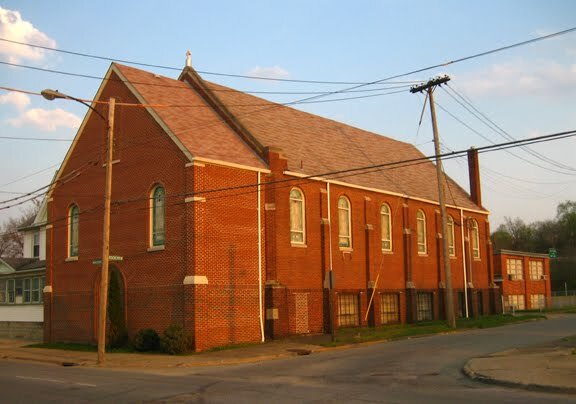 With the introduction of the Calvin Center Idea Incubator as the new addition to the Youngstown Cultural Community, grand expansion was necessary. On May 1st and 2nd, 2010, from noon till 5 pm (check times on each venue), most businesses on lower Mahoning will be open at least one of the days and will be holding special events in celebration of the Festival. 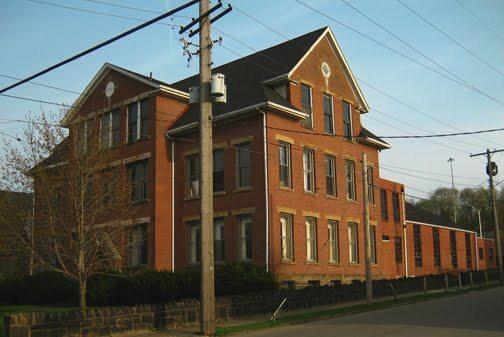 Most of the businesses and cultural organizations of the Mahoning Commons will be involved, including Fellows Riverside Gardens, the Old Ward Bakery, Star Supply, Rockview Christian Church, The Calvin Center Idea Incubator, the Victorian Players, and the historic B&O Station/Brewery, tentatively. All of the venues will be providing special events and tours. Park at any of the venues and catch a ride on the Free Shuttle Service provided by the THE PURPLE CAT. There will be plenty of parking available in the many lots. THIS IS A FREE EVENT! The Artists of the Mahoning Commons are more than pleased to announce the recent addition to our endeavors, The Calvin Center Idea Incubator. A turn of the century Victorian Era Public School, this gorgeous building now houses the Artists of the Rust Belt and the the Rust Belt Theater Company. The CCII will be open Saturday, May 1st, Noon till Midnight and Sunday, May 2nd, noon till 5pm. Arts Youngstown will be serving cold beer during this time to raise funds and will also be displaying work by regional artists throughout the building. Artists of the Rust Belt will host an artist market from noon till 5 pm both days and will be holding a Chance Auction of fine art and craft items from participating artisans. 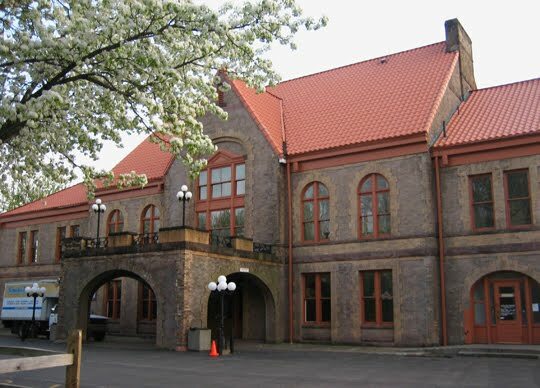 The Rust Belt Theater Company will be holding surprise performances throughout the building to lend atmosphere to this charming venue. The infamous (dare I say Notorious) Viking Jim Allgren of The Home Grown Show on 93.3 The Wolf will provide D.J. 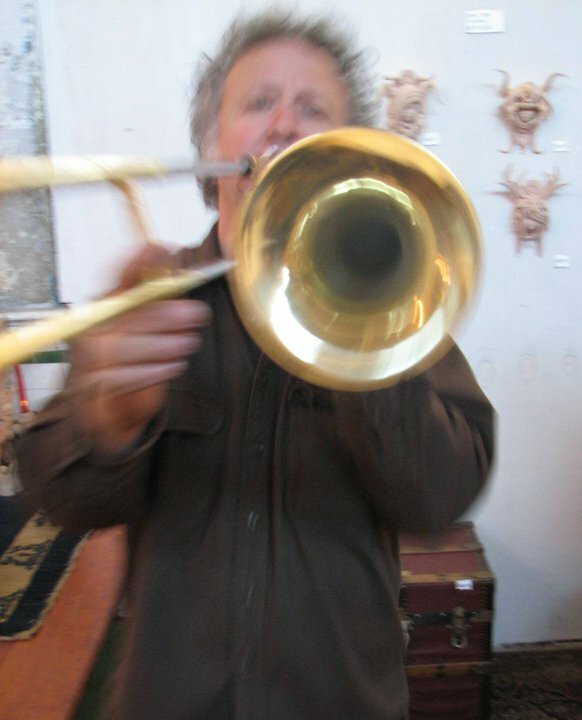 services during the daylight hours for your entertainment, featuring tracks from local musicians. Starting at 8 pm on Saturday night, and ending at Midnight ($3 cover charge), a fine line up of local bands will take the stage. These include: Sam Goodwill, Braille, Fillmore Jive, and Tigerstyle. You must be 18 years or older and provide a photo I.D. to attend. The Purple Cat will provide shuttle service from noon till five on Saturday and Sunday. Gardens open dawn til dusk. Visitors center open 10 am til 5 pm Saturday, May 1st and Sunday, May 2nd. Stop in the Weller Gallery to see the very fine, large scale glass sculpture of Akron artist Jack Baker. Truly amazing work. We are privileged to have his work hosted in Youngstown. The Purple Cat Shuttle will be available from noon till 5 pm both days. B&O STATION AND RUST BELT BREWING CO. The Rust Belt Brewing Company, located in the gorgeous, early 2oth century B&O Train Station, will be giving brewery tours and offering beer tastings on Saturday, May 1st and Sunday, May 2nd, from noon till 8 pm. If you haven't yet seen this wonderful building or tasted this fine beer, come on down and experience Youngstown's past and present Greatness! -will be hosting several art events on May 1st from 4 pm til 10 pm (followed by "Lemonisco!") and on May 2nd from 11 am till 10 pm. Events will include live, creative, Art performances by regional artists, Michael Green, Eric Alleman, David John Pokrivnak, Courtney Waskin, Julius Veal, Katy Gould and others! Original artwork will be on display throughout the Lemon Grove. Shuttle service by the Purple cat will be provide from noon til 5pm both days. The Lemon Grove is open until 4 am every night and serves fine food and drinks. The LG is a Proud Supporter of the Arts and Culture in Youngstown, Ohio. -will be hosting visitors Saturday, May 1st, and Sunday, May 2nd, Noon till 5 pm. The Purple Cat Shuttle will be available.